Capital District residents would visit an aquarium in Albany, but I'm not convinced that they'd visit often. Aquarium visits tend to be inherently passive. As my eight-year-old said, "You're kind of just looking at animals." Educators know that hands-on exhibits that engage visitors are both popular and effective, and designers respond by doing what they can. My kids and I recently spent a magical hour touching stingrays at Chicago's Shedd Aquarium, and we loved it. But the majority of our visit was looking at tanks. Aquariums aren't an episode of Tanked, so there just isn't much wacky climbing in among the sharks. 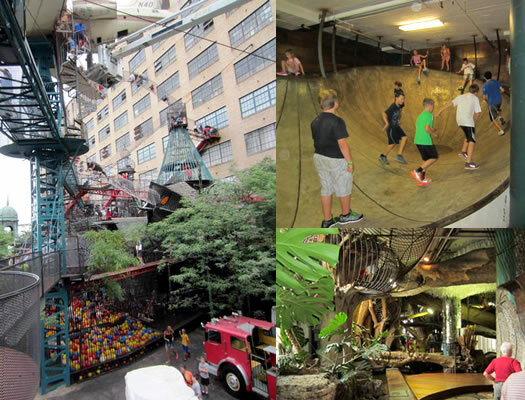 If you have kids in the Capital District, you know what we really need: relief from cabin fever with an indoor space that offers plenty of opportunity to run and play -- which is what we found on our recent visit to The City Museum in St. Louis. Housed in the 600,000 square-foot former International Shoe Company, the museum is an eclectic mixture of children's playground, funhouse, surrealistic pavilion, and architectural marvel made out of unique, found objects. The brainchild of internationally acclaimed artist Bob Cassilly, a classically trained sculptor and serial entrepreneur ... Cassilly and his longtime crew of 20 artisans have constructed the museum from the very stuff of the city; and, as a result, it has urban roots deeper than any other institutions'. Reaching no farther than municipal borders for its reclaimed building materials, City Museum boasts features such as old chimneys, salvaged bridges, construction cranes, miles of tile, and even two abandoned planes! The City Museum is aesthetically inspiring with gorgeous sculptural, climbable creations and collages of reclaimed materials. Kids and grown-ups explore Slinky-style tubes of steel, people-made caves, hollowed trees and tree house perches that feel quite dangerously high and slide down multiple-story slides in playgrounds that meander both outside and inside. 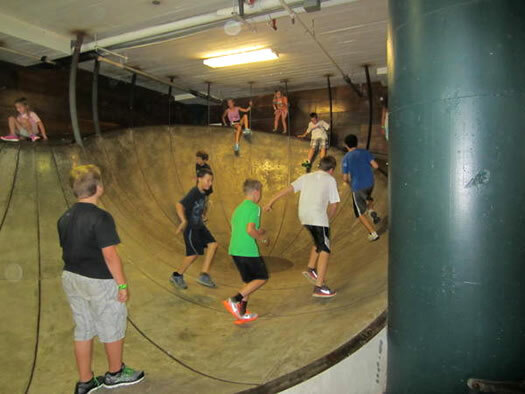 Indoors, there's a maze that's so pitch-black that some of the regulars bring along headlamp flashlights, ropes for swinging and climbing, and spaces that resemble curved skateboarding parks -- except that kids are just running wildly up and down the walls. 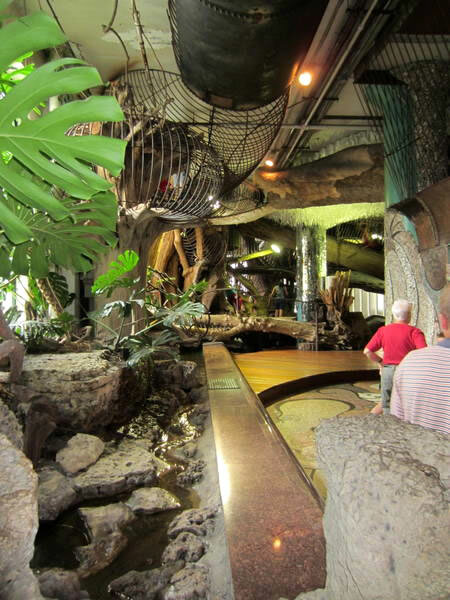 Incidentally, The City Museum also houses an aquarium, but on our visit we decided to skip it because everything else was so much fun. Kids were running, jumping, climbing, and sweating like crazy as if they were each single-handedly trying to combat the nation's obesity epidemic. Honestly? It felt like a bit like a junior mosh pit. There's a cheerful chaos to the entire place. Staff are unobtrusive and there's very little instruction or direction. Visitors encounter traffic jams or spaces that are just too tight a squeeze for some folks, or they see a destination and have to figure out how to get to it. Every visitor who is exploring the exhibits can't help but think critically, solving problems and negotiating with strangers to accommodate each other, and the result is an experience that engages both mind and body. When we visited, the entire museum was remarkably busy, and we were amazed by how well the kids took turns while throwing themselves into the action. Kids were running, jumping, climbing, and sweating like crazy as if they were each single-handedly trying to combat the nation's obesity epidemic. Honestly? It felt like a bit like a junior mosh pit. So, I want one. St. Louis is a 15-hour drive, and that's without any stops. I have kids, so we make a few stops. And of course I'm not proposing an exact replica (though my kids are in favor of it). But the spirit of the place -- creative, active, and playful -- is something that would benefit people anywhere, especially now, when kids are getting slammed by tests and most of us could use a bit more physical activity. Our area is packed with smart, creative people who can use The City Museum as a point of departure and build a truly unique space. I'd love to see them incorporate elements of what's wonderful about our region: play spaces could be inspired by the Adirondacks and gorgeous glacial formations, with technological innovations and structural elements from our train and canal history, for example, to make a space that showcases so much beyond downtown Albany that this area has to offer while showing visitors from near and far a return-worthy, excellent time. Katie Beltramo is editor at KidsOutAndAbout and blogs at Capital District Fun. She's also a former museum education director. Success in Albany isn't going to be one golden idea, it's going to take a multifaceted approach in planning that will bring in people of all ages to enjoy the capital of our fair state. And we're all going to have to work TOGETHER to make this happen. Something like this would be great. Not only would it provide a destination, but it would add a year round amenity to the area. I love this idea! Central Warehouse, anyone? Aquarium proponents seem to me to have their hearts in the right place but are trying to solve the wrong problem. Albany has no problem drawing people in to the city: the city's population nearly doubles every work day (http://www.timesunion.com/local/article/Ever-shifting-head-count-4617829.php). The problem is how to turn that huge transient population into permanent (tax paying) residents. Rather than worrying about building novelties to attract more visitors we should be thinking about infrastructure to make the city more attractive to permanent residents. Think first class outdoor sporting fields like Pier 40 in Manhattan, bike lanes, etc. I think this is a great idea, and both Boston and Chicago have similar museums, though they are both call "Children's Museum". Think the Saratoga Springs Children's Museum, but bigger, with more fun stuff, and larger budgets. I think between the great authors and others that we have in this area, we could create a very interesting and compelling interactive museum for families to explore. It could even contain many elements of an aquarium featuring local flora and fauna. I like this idea A LOT. However, it too fails to recognize the many historic sites and museums that already exist in Albany. These organizations are struggling. One reason for that struggle is their focus on history. Our history and cultural heritage has become a poor step-child to science and children's museums despite offering award winning programs and events. Lots of people say they are patriots but they know nothing of their history and do nothing to preserve it. Albany has an amazing story to tell. We must take advantage of that story and present it in a compelling way. I agree with J. we need a multi-pronged approach. Start with this: Go out and visit one of the local historic sites and learn something about Albany's amazing history. Get involved and help strengthen these special places. Get involved in volunteer efforts to bring fun new attractions to Albany, pay attention to local news and organizations. GET INVOLVED instead of sitting back complaining about how boring Albany is. The New Children's Museum in San Diego is fun and while it seems to be more focused on art, it's probably along similar lines as The City Museum. I've never visited it myself, but from the description that museum in St. Louis sounds abysmal. Yes, kids absolutely need to run around. That's what parks are for. But kids also need to learn how to observe, think, and pay attention. Real science museums and aquariums cultivate that capacity, as do high quality art museums. The "museum" described above, on the other hand, looks like a glorified Chuck-e-Cheese. Nothing wrong with Chuck-e-cheeses, but they don't need to be tax-payer funded, and they should be considered cultural institutions. I agree with Mike D. above. There is no silver bullet "attraction" that will enliven Albany. Regional cities everywhere pursue this elusive goal. What we need to do is to make the city livable for its residents, with excellent transit, well-maintained parks, bike lanes, pedestrian signage, reductions in urban blight, and re-connection to our city's greatest recreational resource, the Hudson River. I work in historic preservation and typically would agree with the last post, that before creating another museum, we need to support the ones we have. This concept, however, stands apart from being "just another museum." Hearing what a difference City Museum has made in St. Louis - that it has become a major tourist draw, that it engages children and adults, and that it has events for multiple generations - I think this type of museum could contribute significantly to economic development in the region. Bringing visitors to the region would then encourage them to see the other great sites here, like Historic Cherry Hill and the Albany Institute for History and Art. I do think that it would necessitate a collaboration with CMOST and the Schenectady Museum, two small institutions with a lot to offer. Can you imagine if both RPI and GE got together behind a single science museum, instead of each community supporting competing ones? See also: Please Touch Museum, Philadelphia. The main difference I see is that an aquarium has an extremely broad audience, while the place described above is specifically for kids (and their parents). I might be missing something, but I can't figure out why it has 'museum' in the name when it looks like a giant (and admittedly much cooler-looking) Discovery Zone. I echo the sentiments of Mike D. and Jason. As the lucky auntie of nephews and nieces ranging in age 5-19 who are all very anxious to visit this area, I can say without hesitation we are NEVER at a loss for something to do. (the only void we felt was never getting to go on the Aquaducks tour). And I will admit the allure of an aquarium is lost on me. I'd love the see the city more hospitable to residents and businesses (and no, I don't mean large developers who are given tax breaks) so people look at living in the city limits as a positive and are inclined to come here and STAY here. Totally agree, it's not right for this city. Two words: Dutch Village. Living history! I'd prefer something that would engage adults as well as families with children. As far as economic development, adults are the ones who spend money: local restaurants, retail. I'm not against a hands-on children's museum, but I don't see it as the lynch pin of Albany tourism, and it offers absolutely nothing to me so please don't spend my taxes on it. @Mike D, I agree about more amenities for residents. I only live 20 minutes away from downtown Albany, but there's a widespread perception in the 'burbs that getting to/parking in downtown Albany is a pain in the neck and/or not worth the effort. Via blog/newsletter I often tell families about multiple activities happening close to each other to try to entice them downtown in the hope that they'll realize it's easy and fun. I'd love to see more efforts to change that perception. @SomeoneinAlbany, I'm a huge history geek and I know that history attractions can be done to appeal to kids and grown-ups (The Farmers' Museum is an awesome example). I'd love to see money/effort poured into one of our existing sites to enhance it, but for me, it's difficult to choose which, so I can't envision what would work best. But here's where I have to plug Schenectady, b/c I love thinking of it as the "wild west" for the earliest colonials trying to avoid paying fees on fur trading. It's so entrepreneurial and adventurous and American, plus of course there's the drama of the Stockade. @Jason, I do think that "museum" in this case is a bit of a misnomer, or at least it's not what you'd expect from a museum, but the point is that it makes people "observe, think, & pay attention" in an active way. That's what was so brilliant about it. I guess I didn't communicate that clearly. @Erin T, oh my gosh, a miSci/CMOST/GE collaboration is another fantasy of mine, BIG TIME. @Paul, again "museum" isn't quite the right word, but there were plenty of adults who were having an unbelievably good time, and that made me think that it's a great choice for this area, with so many active folks, like the 46ers. I do think it's not necessarily the best destination for the elderly & those with mobility issues, but I could imagine childless adults doing this like they might do rock climbing walls and ropes courses. I'd be interested to see the visitor stats. Well, in any case, thanks for reading! The point being we need things scaled to what we are. If you include our whole metro area, you start to get almost as many people as these other cities have within their borders. I tend to agree with the folks who say what really needs to be done is to make the city more attractive to live in. Liveable communities create their own attraction, and worry less about people coming in from outside to help liven things up. On the other side of it, I think people have big dreams for Albany. We're the state capital - regardless of the population numbers, we expect big attractions. I think you hit the nail on the head! Every time the aquarium idea comes up, everyone seems so enthusiastic, yet tepid, like we want a big main attraction but an aquarium isnâ€™t exactly it. The City Museum is a perfect model. I only heard of it a few years ago, and ever since, St. Louis has been near the top of my list of cities to visit. St. Louis is another one of those cities that never stuck out as a place I needed to visit, until this museum came along, and I think people feel the same way about Albany. And Erin T, CENTRAL WAREHOUSE! YES! Too big and bulky to destroy, so letâ€™s turn it into a funpark. Weâ€™ve got enough history, historical interpreters, historic parks, battlefields, homes, neighborhoods, and history museums for one area! I love that stuff but we are absolutely crushed underneath all of it. Canâ€™t we just get one crazy fun park in the center of the city??? I have been saying loudly to myself that Central Warehouse should become City Museum East for a while. 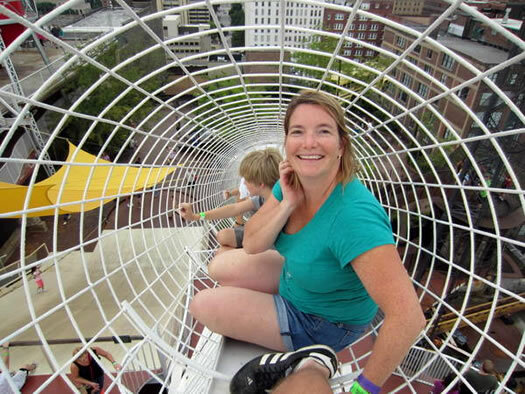 I have visited St. Louis twice primarily because of City Museum. Please, Please, Please!!!!! It would make Albany all kinds of Awesome! And for those thinking this is just a "children's museum"' it is NOT. They are usually open until midnight Fridays and Saturdays and turn out the lights and provide flashlights at 10pm. And they have a bar. Adults can have fun too you know! Having something like this ANYWHERE in the capital district would be fantastic! It would be nice to have something that didn't become 'stale' after the first visit. 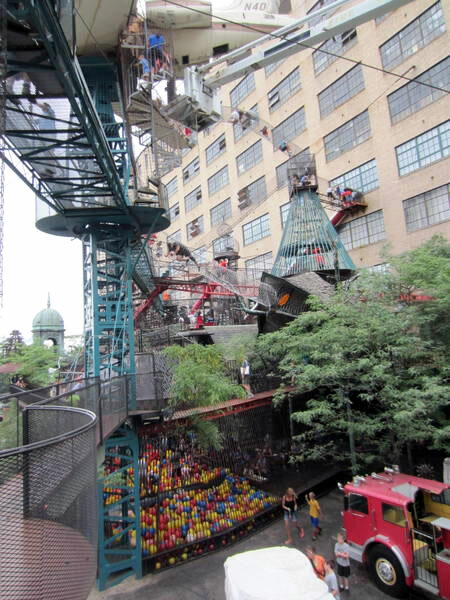 My family and I would go to something like the City Museum over and over again for sure!